Japan’s H-IIB rocket with the HTV-7 resupply ship on top blasts off at 1:52 p.m. EDT on Friday, Sept. 22 (2:52 a.m. Sept. 23 Japan standard time) from the Tanegashima Space Center. 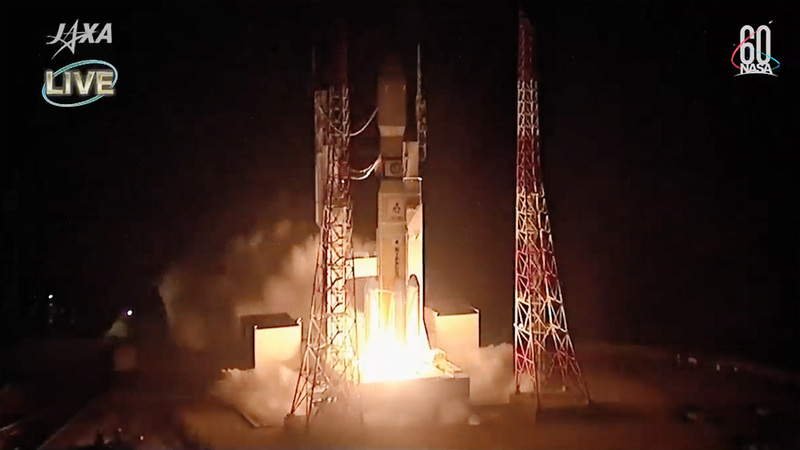 The Japan Aerospace Exploration Agency (JAXA)’s H-IIB rocket launched at 1:52 p.m. EDT on Saturday, Sept. 22 (2:52 a.m. Sept. 23 Japan standard time) from the Tanegashima Space Center in southern Japan. At the time of launch, the space station was 254 miles over the southwest Pacific, west of Chile. A little more than 15 minutes after launch, the unpiloted H-II Transfer Vehicle-7 (HTV-7) cargo spacecraft successfully separated from the rocket and began its four-and-a-half rendezvous with the International Space Station. On Thursday, Sept. 27, the HTV-7 will approach the station from below and slowly inch its way toward the orbiting laboratory. Expedition 56 Commander Drew Feustel and Flight Engineer Serena Auñón-Chancellor of NASA will operate the station’s Canadarm2 robotic arm to capture the spacecraft as it approaches. Flight Engineer Alexander Gerst of ESA (European Space Agency) will monitor HTV-7 systems during its approach. Robotic ground controllers will then install it on the Earth-facing side of the Harmony module, where it will remain for several weeks. NASA TV coverage of the Sept. 27 rendezvous and grapple will begin at 6:30 a.m. ET. Capture is scheduled for approximately 8:00 a.m. After a break, NASA TV coverage will resume at 10:30 a.m. for spacecraft installation to the space station’s Harmony module. In addition to new hardware to upgrade the station’s electrical power system, the HTV-7 is carrying a new sample holder for the Electrostatic Levitation Furnace (JAXA-ELF), a protein crystal growth experiment at low temperatures (JAXA LT PCG), an investigation that looks at the effect of microgravity on bone marrow (MARROW), a Life Sciences Glovebox, and additional EXPRESS Racks. Are the dates correct? Wasn’t on Friday Sept. 21, 2018 (U.S. time) and Saturday Sept. 22, 2018 (local time in Japan)? What about Sept. 27? The launch date has been corrected to Saturday Sept. 22. The Japanese cargo craft is still due arrive Sept. 27 at the International Space Station. Thanks! thanks for all the great footage, best wishes especially with parker probe. My brother and I have just watched the Space Station pass over head (UK @ approx. 20:53), followed a moment later by HTV-7. It’s fabulous to be able to see all this happening! 9/26/2018, 23:30 EST – Just watched the ISS and HTV-7 pass over the Seattle Washington area. Everything looks good from here. Je viens de voir les images de la Terre diffusées en direct de l’ISS….FABULEUX. Merci à la NASA de nous faire partager cette extraordinaire aventure.